Done for this week's Illustration Friday topic, 'Clear'. A lot of fun to do, contrasting the two very different expressions. I added a vintage comicbook appearance by keeping the colours simple and by applying the 'Colour Halftone' filter in Photoshop. Heehee...great concept! very well done! More so, the speed lines are a great effect! Very cool indeed, Chris! 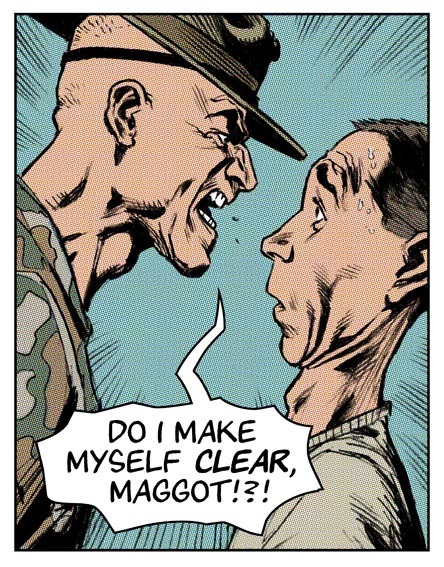 Excellent comic book style, Maggot! I alway enjoy comic style illustration, this is great! Very nice. An enviable style. So classic. ha ha! great stuff--so well done. Brings back memories...my first encounter was when a group of drills and an officer surrounded me and each was shouting questions...too bad I had my duffle bag strapped on my back and kept turning to answer...it was almost like a three stooges exercise...until the pushup retribution...great pic! Wow, your art is really amazing and inspiring. I really like your style and versatility. Nice comic book style. Very well done! your technique is great dude! hope to see new stuff from you soon! Cool expression, I can hear his yell! Great idea and perfect execution! Just excellent, man. Damn Chris! I stepped out for a little while and I return to so many art goodies - I'm floored! Great exaggeration on both faces! Hey, thanks everyone! Loving your comments. Nicely done. Great interpretation of the topic. This is sweet chris> I also love the contrasting expressions on their faces. I had fun visiting your blogs. Oh, perfectly! Clear, that is! This is such a great tangential spin on the Topic and a timeless depiction of a classic situation. Ian- Thanks and thanks again for pointing me in the direction of Illustration Friday. madamegaston- I'm always amazed and jealous when I visit your blog and realise how young you are. Great work! Wow, I am at a loss for words. Your stuff is great. Is it true that you are self-taught? if so, you are an inspiration. I too am self-taught; my family would not help with college expenses if I studied art so I had to opt for Econ. I have seen your videos and do you now only draw on the wacom tablet? I have tried that but just cannot get the feel that. Anyway I am a new fan of yours, thank you for the site. Rod- Thanks! Yes, I'm self-taught. It's a good and a bad thing, I guess. Good in that your skills evolve in isolation and this can usually lead to something unique stylistically. Bad because you can sometimes overlook really obvious lessons that would be easily learnt in college. The illos on my videos are drawn with the tablet, but more often I still hand draw and scan the pencils or inks into Photoshop. I don't know if you've ever seen any of the Punisher Max comics, but your Maggot looks like a brunette version of Stevie from Born.